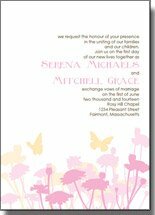 These couture butterfly wedding invitations are both unique and richly elegant. Although the papers are actually sewn together, you do not have to be an expert seamstress to create these. Most any basic sewing machine will do, or even one of those small crafting sewing machines should do the trick. 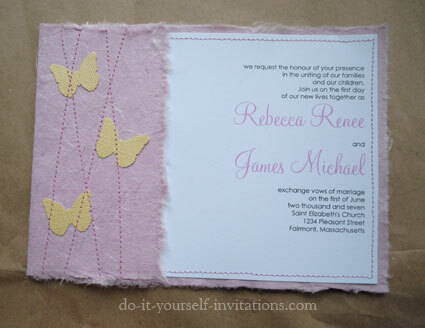 I chose handmade cotton and silk papers paired with textured cardstock, hand punched butterflies to put together this invite. The results are stunning! Pictures do not do it justice! 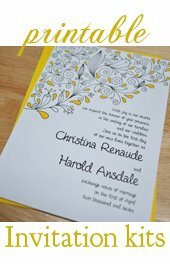 The beauty is, this invite could be made to match with pretty much any wedding theme or color palette. Shop around for different paper. Choose different paper punch pieces or die cuts. Play with different colored threads. The combinations are endless! Printing The Wedding Invitation Wording. Start by formatting and printing your wording onto a 5 by 7 inch card facing in the landscape alignment (horizontal on the card). 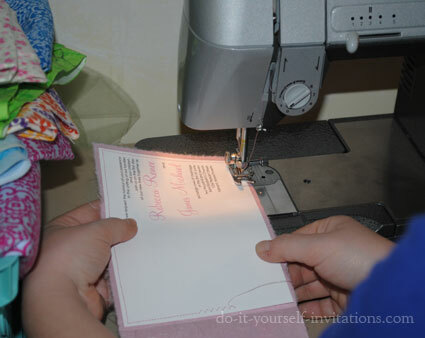 A super easy way to do this is to simply use one of the free invitation templates available here on the website. 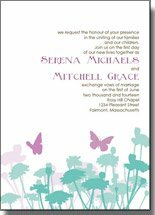 We have wedding invitation templates for everything from printing the wording on your invitations, to rsvp's, place cards, and more. Our templates have some helpful cutting guideline making it a snap to print and trim your invites to size from a regular sheet of 8 1/2" by 11" paper. 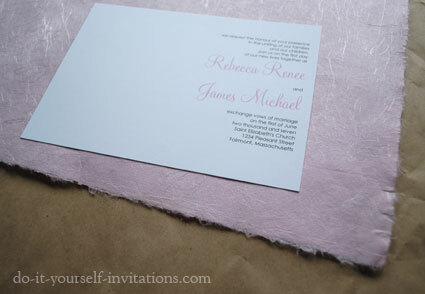 I chose a wonderful handmade paper with fancy strands of silk woven throughout. It almost has the feel of soft cotton fabric. It is a very luxurious and elegant paper. 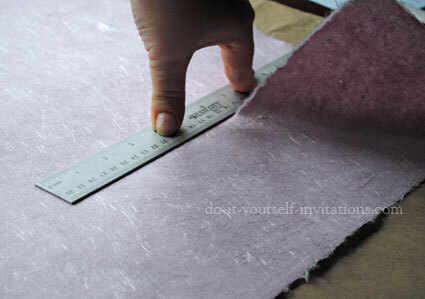 You can use any handmade paper that suits your fancy! My favorite place to shop for handmade papers is the Handmade Paper Superstore. I have a really hard time shopping there without buying way more papers than I actually need. I know - I have a problem. Lol! Who really loves paper this much?? Most of the true handmade papers have a raw edge - what is sometimes called a deckle edge. I really like to make use of the raw edges. I think it adds texture and interest. However, if it is not your thing, use a paper cutter to size your paper and you'll do away with that rustic looking edge. Me? I tear the paper to the chosen size. I know it sounds difficult, but really it isn't. The trick is to score it before tearing and use a ruler to keep the tearing straight. Simply measure away from the edge and create any needed marks. You can use an invisible ink marker (made for sewing) to make your marks. Line a ruler up against the marks you made and score the paper. Hold the ruler in place and tear away. You can tear the paper into longish strips and the tear away some more to shorten the strips to the correct length. 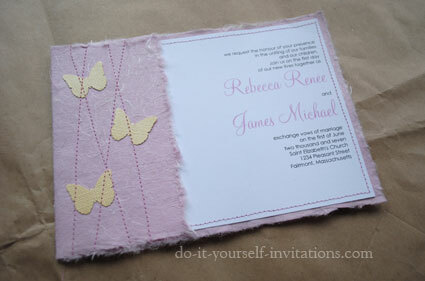 Since my butterfly invitations were to be sized at 5 by 7 inches, I tore the sheets into 5.75" by 9.75" strips. Making the paper butterflies is simple. Just use a paper punch. Any butterfly punch will do. I used a punch by Martha Stewart. There are several available by Martha, as well as many others from different brands and companies. You could also use a die cutting machine, or pre cut shapes or embellishments. I punched the shapes out of some yellow textured, shiny metallic cardstock from Bazzill's.The contrast between the papers really adds some interest and makes everything "pop". Did you know that couture pretty much means "sewn with detail" or "custom sewn"? 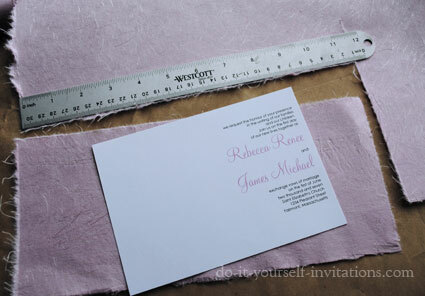 Well for an invitation, these certainly are sewn with detail! I started by adding a couple dabs of adhesive on the back of the printed cardstock to hold it in place on the handmade paper. I centered it onto the paper, lining it up to the right side of the paper. Starting from the top left hand corner I sewed close to the edge, stopping and pivoting at the corners. To pivot the paper stop sewing and lift the presser foot ever so lightly to turn the paper in place. Continue sewing to the next corner and repeat. 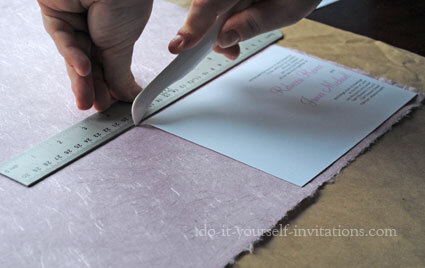 After all three outer edges were sewn, I then folded the handmade paper at the left side over to reach about a third of the way across the invite. I added a couple more dabs of adhesive to hold the paper down while sewing. 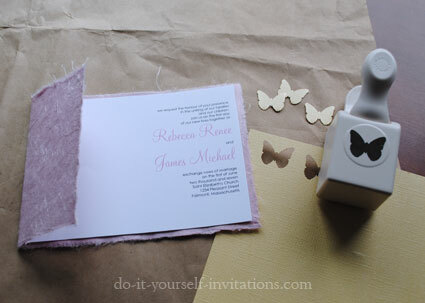 I dabbed some adhesive onto the back of the butterflies and arranged them onto the handmade paper on the front of the invitations. 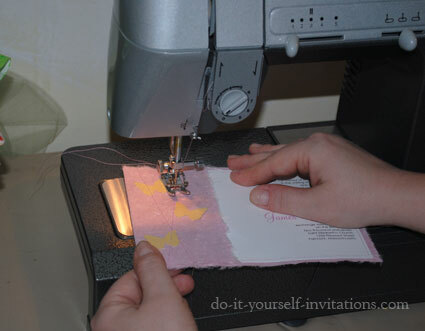 To finish the butterfly wedding invitations I sewed a few lines at a slight angle across the front so that they ran through the butterflies holding them in place for good. Don't have the time to make them yourself? 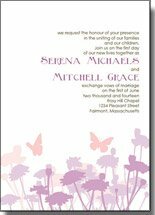 Contact Me to order custom handmade butterfly invitations.